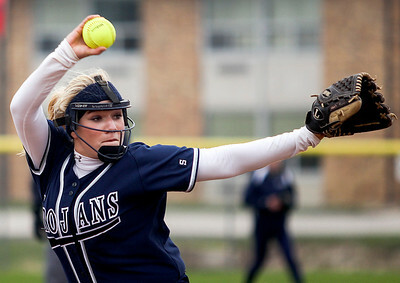 Sarah Nader- snader@shawmedia.com Cary-Grove's Amanda DeGroote pitches during Monday's home game against Huntley April 18, 2014. Rain suspended the game in the bottom of the fifth inning with the scored tied, 1-1. 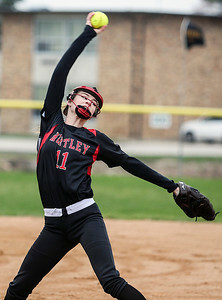 Sarah Nader- snader@shawmedia.com Huntley's Kateri Conklin pitched during Monday's game against Cary-Grove in Cary April 18, 2014. Rain suspended the game in the bottom of the fifth inning with the scored tied, 1-1. 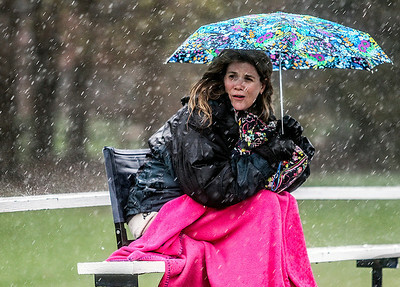 Sarah Nader- snader@shawmedia.com Heidi Adams of Cary waits out the rain while watching after daughter play in a Cary-Grove softball game Monday, April 28, 2014. 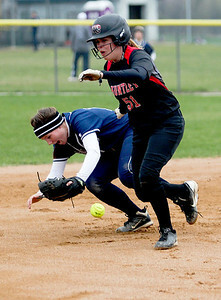 Sarah Nader- snader@shawmedia.com Cary-Grove's Jamie Deering (left) falls over after Huntley's Tamara Funke collides into her during the fourth inning of Monday's game April 18, 2014. Rain suspended the game in the bottom of the fifth inning with the scored tied, 1-1. 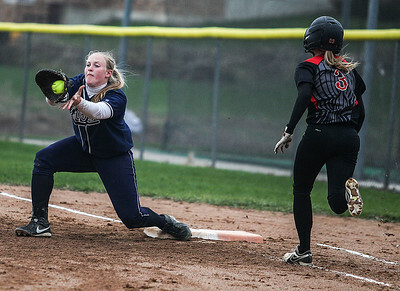 Sarah Nader- snader@shawmedia.com Cary-Grove's Brianne Prank (left) catches the ball while Huntley's Taylor Stone is out at first during the fourth inning of Monday's home game in Cary April 18, 2014. Rain suspended the game in the bottom of the fifth inning with the scored tied, 1-1. 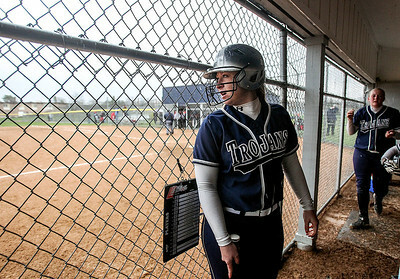 Sarah Nader- snader@shawmedia.com Cary-Grove's Caroline Zasadil looks out of the dugout during a rain delay at Monday's home game against Huntley April 18, 2014. Rain suspended the game in the bottom of the fifth inning with the scored tied, 1-1. 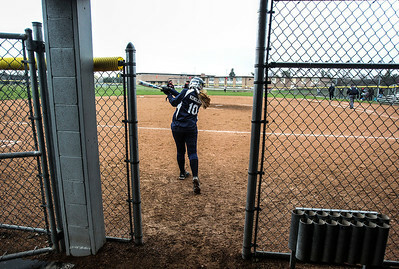 Sarah Nader- snader@shawmedia.com Cary-Grove's Sarah Kendeigh warms up after a brief rain delay during Monday's home game against Huntley April 18, 2014. Rain suspended the game in the bottom of the fifth inning with the scored tied, 1-1. Sarah Nader- snader@shawmedia.com Huntley's Megan Larson runs towards home during the fourth inning during Monday's game against Cary-Grove April 18, 2014. Rain suspended the game in the bottom of the fifth inning with the scored tied, 1-1. 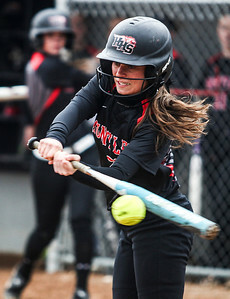 Sarah Nader- snader@shawmedia.com Huntley's Brittany Koss makes contact with the ball during Monday's game against Cary-Grove April 18, 2014. Rain suspended the game in the bottom of the fifth inning with the scored tied, 1-1. 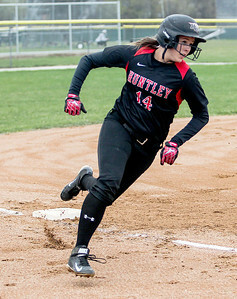 Huntley's Megan Larson runs towards home during the fourth inning during Monday's game against Cary-Grove April 18, 2014. Rain suspended the game in the bottom of the fifth inning with the scored tied, 1-1.